DURHAM, NC – Despite a hard fought effort and leading through good chunks of the game, Marist fell to Duke 64-56. The Red Foxes now stand at 6-2. Alana Gilmer came in hot during the first quarter, scoring 11 of her 13 points in the half during the first frame. 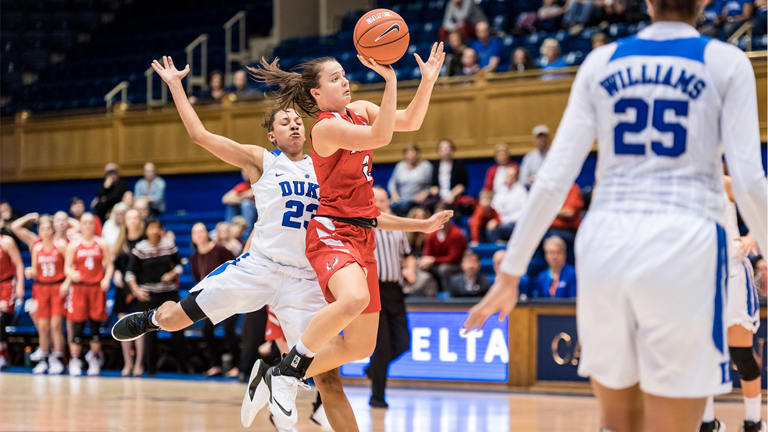 Marist’s defense was able to bottle Duke up, holding them scoreless for almost five minutes. Lovisa Henningsdottir tallied two blocks during the first quarter and Marist took a 13-11 lead into the second quarter. Duke would take its first lead of the quarter from a three pointer from Miela Goodchild to make the score 22-21 with 3:41 left. But the Blue Devils could not stop a hot handed Allie Best who shot 3-for-3 from the three, including a buzzer beater to take a 29-28 lead at the end of the half. A three-pointer from Rebekah Hand gave Marist a 41-36 lead with 2:51 left in the third quarter. But back to back threes from Duke and a couple of missed baskets from Marist shifted the lead over to the Blue Devils 42-41. The teams would trade leads a couple of times to start the final quarter. The Blue Devils used a fast break to go up 58-50 with 1:40 left in the game. Marist had a chance to come back, but a couple of three’s down the line did not land and Duke shot well enough from the line to preserve the lead. Marist will head north to face Albany on December 8. Tip-off is scheduled for 2 p.m.